Our fully air conditioned lakeside villa, completed in 2003, offers all the benefits of home and much, much, more. South facing private pool and games room. Minutes drive away from Disney & Shopping. FIRST IMPRESSIONS: Our fully air conditioned lakeside villa, completed in 2003, offers all the benefits of home and much, much, more. 4 bedrooms including 2 master suites both with king beds and his/her vanity basins, 3.5 baths including a pool bath, a Great Room, fully fitted kitchen, south-facing screened deck with pool and spa and a two car garage (with electronic door opener). Just open the front entry door and you can see right through the bright, spacious living area to the sparkling pool and lake at the rear, WOW! Pictures, plants and designer decorations complete a real Florida feel and adds to that feeling of luxury. PEACE OF MIND: Our on-site Management company is available 24hrs a day to offer any assistance you may require including a concierge service allowing you to collect your Villa key on arrival at the resort. RECREATION: The on-site Resort clubhouse offers all guests free use of a number of recreational activities. These include, a resort-style swimming pool, basketball, volleyball, tennis, clubhouse with gym, billiards, movies and internet access. SLEEPING (4-beds/3.5-baths): Master 1 has a king size bed, walk-in wardrobe closet, bedside cabinets, large dressing table and mirror. The en-suite features 'his & hers' vanity basins, an oversized garden tub bath and separate shower. This master suite faces south and overlooks the pool area through large patio doors. Master 2 features a king size bed, large walk-in wardrobe closet, bedside cabinets, large dressing table and mirror. The en-suite features ‘his and hers' vanity basins, an oversized garden tub bath and separate shower. This master suite is at the front of the property. The two remaining bedrooms are both twins with 3' beds, bedside tables, chests and large wardrobe closets. A dedicated bathroom with a walk-in shower serves both these bedrooms. RELAXING: The large 13' x 26' south-facing pool with spa is ideal for relaxing and cooling off. (Pool heating is available). There is a pool bathroom and the deck area is screened and has outside lighting allowing evening entertainment. The deluxe pool furniture includes padded chairs, table and loungers. Just sit, relax and watch the activity on the lake – birds, herons and all types of wildlife but no alligators! Inside, the "Great Room" overlooks the pool and lake, it has 2 comfortable sofas, one of which is a queen sofa bed, chairs, coffee table and 51" HDTV. COOKING: All the appliances you need - cooker, microwave, dishwasher and a large 2-door American fridge/freezer. The sink includes a water filter system and waste disposal. All crockery, cutlery, utensils and glasses are provided. EATING: The dining area is in part of the Great Room adjacent to the kitchen. The table seats up to eight and there are three stools at the nearby breakfast bar. Don't forget you can even dine waterside, overlooking the lake. CABLE TELEVISION: Each bedroom has a cable television with the twin rooms also having video players for the children. A large-screen TV and DVD player are situated in the Great Room. Music can be played through the CD stereo if preferred. BABIES & TODDLERS: Are more than welcome. Please ask for anything you need. There are cots, high chairs, bottle warmers, lots of extra sheets and blankets, etc available. PC/INTERNET: Free unlimited high-speed internet and email access with a permanent connection. UTILITIES: The laundry closet is adjacent to the kitchen area and has a full size washing machine and drier, complete with iron and ironing board. All bed linens, towels and beach towels are included. The villa is cleaned both before and after your visit. There are telephones in the Kitchen and both Master suites – they give free local calls and international calls are possible. We also have an additional superb 7 bedroom villa in Glenbrook. GBR7501. • Es wird eine Kaution ($540) mit der letzten Zahlung erwartet. Everything was great. The house was neat and clean and had everything needed for the stay. Instructions were clear and we had no problem whatsoever. 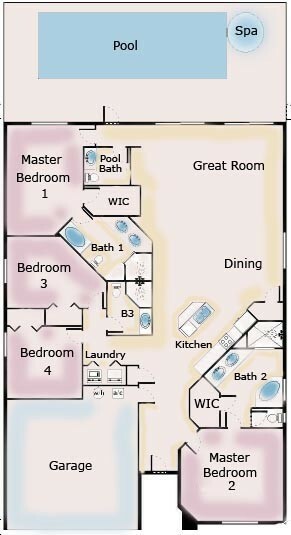 Jacuzzi and pool, plus game room are definitely a huge plus! Excellent location, good distribution and space in the house. Eine Villa wie aus dem Bilderbuch sehr ruhig und schön gelgen am See super pool ideal für Disney Parks . Etwas zuweit zu UniversalStudios minimum 45Minuten Autofahrt aber trotzdem sehr zu empfehlen. MI FAMILIA Y YO, TE ESTAMOS AGRADECIDOS POR LAS ATENCIONES QUE NOS BRINDASTES NO SOLO COMO CLIENTES DE FLORIDAD VILLAS, SINO EN LO PERSONAL DE AYUDARNOS CON TODOS LOS REQUISITOS QUE EL GOBIERNO NOS HA IMPUESTO, POR ESO UNA Y OTRA VEZ AGRADECIDOS . COMPLETAMENTE A TUS ORDENES Y LO QUE TE PUEDA SER ÚTIL EN LA CIUDAD DE CARACAS - VENEZUELA. SI DIOS ASÍ LO PERMITE ASPIRAMOS A OTRAS VACACIONES TAN PLACENTERAS COMO LAS DEL 2013.
vielen Dank. Es war alles super in der Villa in Orlando. Wenn ich wieder nach Orlando komme, werde ich mich bei Ihnen melden. Hat alles super geklappt. Wir waren sehr positiv überrascht über die Villa, da sie uns besser gefiel, als sie in den Fotos dargestellt wurde. Wir haben uns dort sehr wohl gefühlt. Die Vergnügungsparks sind alle schnell zu erreichen, sowie Einkaufsmöglichkeiten und Restaurants. Der Kontakt zum FloridaBestVillas Team war sehr nett und sie waren sehr hilfsbereit. Die Sitzecke auf der Terrasse hat uns nicht so zugesagt, allerdings waren wir in Orlando auch so viel unterwegs, dass wir sie nicht sehr genutzt haben. Wir würden jederzeit wieder bei FloridaBestVillas ein Haus mieten. Leider war die Villa nicht ganz so sauber wie gewohnt und einige technische Apparate funktionierten nicht einwandfrei. Zudem hatten wir Probleme mit der WC-Spülung. Der Pool und die Outdoor-Zone sind eher klein für die Grösse der Villa. Geärgert hat uns ein Esstisch mit 6 Stühlen obwohl das Haus für 8 Leute konzipiert ist. Lage und Hausverwaltung waren sehr gut. Insgesamt waren wir aber zufrieden und haben einen problemlosen Urlaub genossen. Wir würden FloridaBestVillas jederzeit weiter empfehlen! Rückmeldung House management 21 April: The guest informed us that they were unable to set the alarm. This was found to be due to the fact that they had transposed one of the digits of the code. 23 April: The guest rang to say there were no lights on the alarm panel. Roger attended the property and found that the great room patio doors had not been lined up properly to enable the system to be ready to arm. Roger left a note explaining this, armed the system, and the alarm system operated correctly. 24 April: The guest complained that all the toilets were not flushing. Roger attended the property expecting to find a problem with the main sewer drain. He found no problem at all. All the toilets were operating correctly. He left a note advising the guests that all toilets were functioning correctly and that if they continued to have any problem they should contact house management again. No further complaint was received. Having been contacted on three occasions by these guests and having responded to each of their concerns we are surprised that they made no mention during their stay of other matters which they now complain of. There is a notice in the villa inviting guests to raise any concerns they may have while they are in residence. The complaint regarding the villa cleanliness we wholeheartedly refute. The villa was checked prior to arrival and was found to be in the usual very high standard of cleanliness which we expect. It should be noted however, that the carpet in the bedrooms is now eight years old and has signs of wear. No amount of carpet cleaning will completely disguise wear particularly in traffic areas. We are always very happy to respond to guests concerns however, if they do not raise these concerns while in residence we are not given the opportunity to rectify the guests concerns and make them happy. So dear guests, please call us if you feel something is not right. The pool is oversized for the Villa, so that the outdoor area is a little smaller. The dinning table is not big enough for 8 people so that all can sit down together for dinner, if requested we can supply folding chairs. Hallo Georg! Wir möchten uns auf diesem Weg für den erholsamen Aufenthalt in der wunderschönen Villa bedanken. Das Haus ist mit allem Wichtigem ausgestattet, sehr sauber und hell. Der Pool war ausreichend gross und lud jeden Tag zum Schwimmen ein. Der Whirlpool war ebenfalls toll. Poolheizung hat auch funktioniert. Wir würden jedem das Haus empfehlen, da es in einer sehr ruhigen Anlage liegt und einen wunderbaren Blick auf den davor liegenden See mit all seinen Wildtieren hat. Einfach idyllisch. Wir freuen uns auf unseren nächsten Besuch. Grüsse aus Bayern. Thank you for the great stay @ your Villa. We were completely satisfied and will be recommending it to all our friends and Family. The pool and spa were so nice and relaxing to come back to after a long day. We had a wonderful stay in this beautiful villa, the lake setting was perfect with fish jumping in the water and birds landing around the lake. The beds were really comfortable and the whole villa well catered for. Great supermarket at the end of the road and close to all the amenities and parks. The pool and jacuzzi were lovely and very welcome in the hot weather of July 2010. 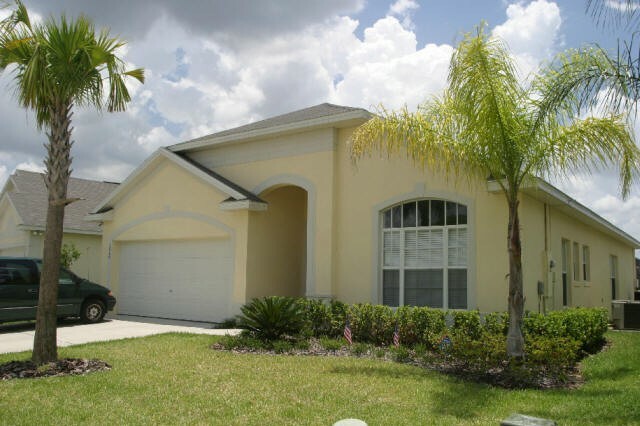 Would recommend this villa as a perfect place to stay when visiting Orlando.